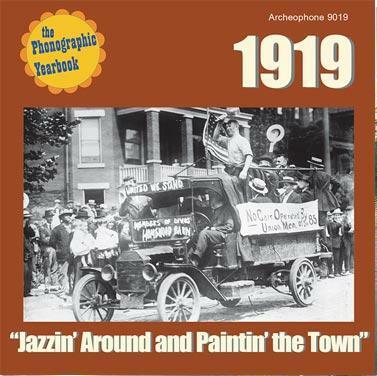 “1919: JAZZIN' AROUND AND PAINTIN' THE TOWN brings you 25 selections from the year Americans returned from war, the White Sox threw the World Series, and labor strife swept the nation. Having ‘done their bit’ and denied raises during the war effort, workers across the country were ready to get their due in peacetime, but business owners resisted. In February 1919, a general strike in Seattle, noteworthy for its peaceful and orderly conduct, brought the city to a standstill. Huge strikes in the coal and steel industries followed later in the year, and they all were denounced as the work of Bolshevists--a growing sentiment that unleashed a Red Scare throughout the land. The Chicago White Sox also couldn't petition for raises, and they certainly couldn't strike back then, so several players conspired with gamblers to throw the World Series. They would become known as the Chicago Black Sox. The music that provided the soundtrack to this season of unrest is notable for its rueful character--even the numbers from the wildly successful Ziegfeld FOLLIES OF 1919. Waltzes and minor keys dominate the post-war soundscape, but the tone is thoughtful and never turns mawkish. Many of the songs—‘After You've Gone’, ‘I'll Say She Does’, ‘A Pretty Girl Is Like a Melody’ and others--are all-time classics. Others were so popular as to require the inclusion here of multiple interpretations. In Henry Burr's hands, ‘Beautiful Ohio’ is a haunting ballad, while Joseph Knecht's Waldorf-Astoria Orchestra makes it a brisk, muscular waltz. Campbell and Burr sing ‘I'm Forever Blowing Bubbles’ with mist in their eyes, while Ben Selvin's Novelty Orchestra make it a playful dance that highlights the xylophone. 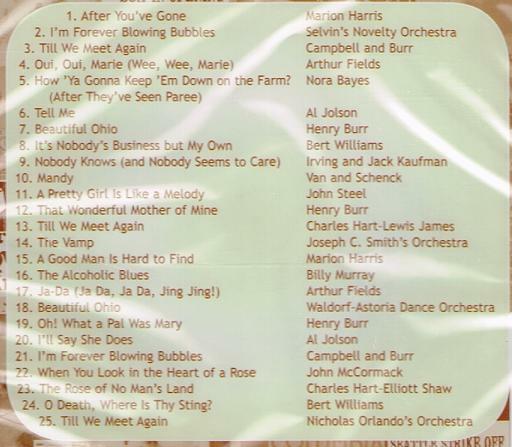 And ‘Till We Meet Again’ was the biggest hit of all, a fitting coda to mark the end of World War I. 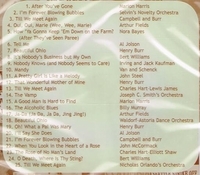 Top performers include Marion Harris, Arthur Fields, Nora Bayes, Bert Williams, and Al Jolson, along with the pre-jazz sound of Joseph C. Smith's Orchestra doing ‘The Vamp’, and Billy Murray crying in ‘The Alcoholic Blues’ about the coming of Prohibition.